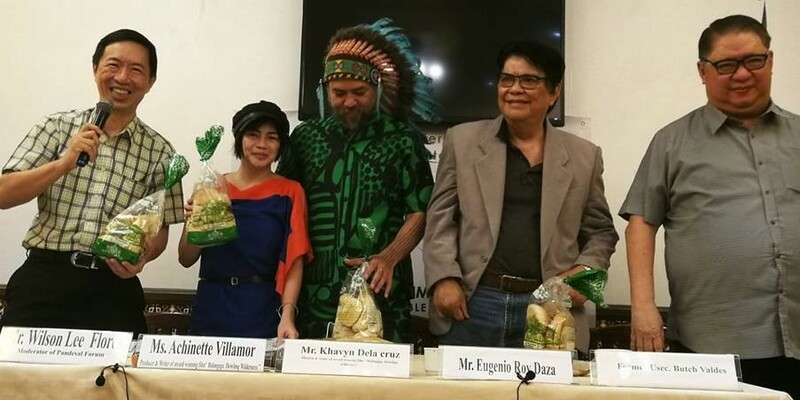 Speakers at Kamuning Bakery Café’s non-partisan Pandesal Forum in Quezon City on August 14 were Balangiga Battle hero Capt. Eugenio Daza’s grandson and president of Kaanak 1896 (association of descendants of the Philippine Revolution and Phil-American War era) Eugenio Roy Daza, “Balangiga: Howling Wilderness” film director & co-writer Khavn de la Cruz and producer/co-writer Achinette Villamor, geopolitics analysts Butch Valdes and George Siy of Integrated Development Studies Institute (IDSI). Moderator is writer Wilson Lee Flores. 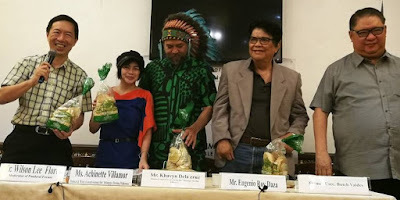 In the Pista ng Pelikulang Pilipino organized by the Film Development Council of the Philippines (FDCP) from August 15 to 21, the Pandesal Forum highly recommends that the public watch watch the award-winning “Balangiga: Howling Wilderness” which had won 3 times as best film at the QCinema 2017, the Urian and Famas. The artists behind “Balangiga: Howling Wilderness” are director and co-scriptwriter Khavn de la Cruz, co-writers Achinette Villamor and Jerry B. Gracio. There are no celebrity stars in the cast led by Justine Samson, Pio Del Rio, Warren Tuaño. It is unique that this movie stands out for its good attempt at artistry, its uncommon courage and its seeking to retell a sad, controversial and violent episode in Philippine history from the refreshing, innocent perspectives of little children. This well-crafted movie is set in 1901 in seaside town of Balangiga in the Philippines’ third largest island of Samar. Eight-year-old Kulas flees the town with his grandfather and their carabao to escape U.S. General Jacob Smith’s controversial “Kill & Burn” military order. He finds an infant amid a sea of corpses and together, the two boys struggle to survive the American military occupation. History---whether sad, happy, tragic or triumphant---is part of our present and influences our future. May these two indie movies on our history not just entertain, but hopefully educate, awaken, conscienticize and inspire us to help create a better and more just future. The non-partisan, liberal and tertulia-inspired Pandesal Forum hopes to help elevate the quality of public discourse on national and global issues by having leaders and newsmakers dialogue with media and intellectuals over simple pandesal meals and coffee or tea. Pandesal Forum’s Moderator is writer Wilson Lee Flores of Quezon City’s pioneer 79-year-old Kamuning Bakery Café. KBC burned down on Feb. 6, 2018, but it is still baking and selling outside burnt ruins and plans to someday fully reopen.